Children playing on an old military tank in Afghanistan. Co-written by Sasiwan Chingchit, Program Officer for Conflict and Development at The Asia Foundation in Bangkok. Where governments do not function well, growth and sustainable development are rare, and destructive, violent conflicts are more likely. Working in such fragile and conflict-affected situations (FCASs)—common across Asia and the Pacific—requires development agencies, including ADB, to do business differently. This means cultivating a deeper understanding of fragility and conflict risks, and recognizing that successfully delivering assistance in these contexts demands a tailored response. Fragile states do not govern effectively, and have poor relationships with the societies they oversee. Weak or dysfunctional institutions and often-inadequate leadership mean that services are not provided, taxes remain uncollected, and state legitimacy is eroded. Lack of government responsiveness frequently fuels large-scale violence, in turn undermining state capacity and performance. Countries can get stuck in a vicious cycle of fragility and conflict from which it is extremely difficult to emerge. 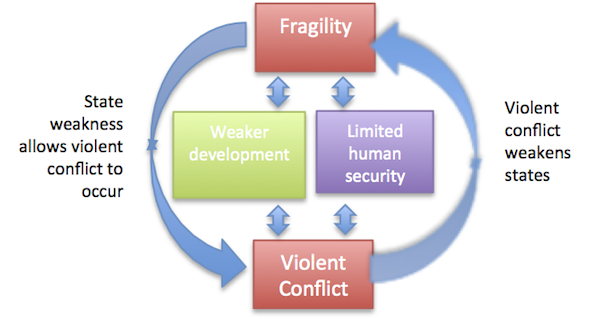 The fragility-conflict cycle. Despite Asia’s turbo-charged growth in recent decades, fragility remains all too common. The OECD’s latest list of fragile countries includes 13 in the region. Beyond these, many stronger states have pockets of fragility and conflict. Subnational conflicts affect half of the countries in South and Southeast Asia, and have killed more than 100,000 people in the past decade. They tend to endure for decades, and often occur in reasonably stable places such as Indonesia and the Philippines. Growth and development are less likely in FCASs. Nearly two-thirds of fragile states are unlikely to meet the Millennium Development Goal (MDG) of halving poverty by the end of 2015. The proportion of the world’s poorest living in fragile countries is likely to rise from 43% to 62% by 2030. Hardly any fragile countries have met a single MDG. Within more stable countries, areas with subnational conflicts tend to lag behind on most measures of development. Fragility undermines human security. In FCASs, conflicts such as civil wars are more likely, but so too are other forms of violence such as urban crime and gender-based violence. Fragility and violence can spill over to other areas, as can solutions to them. Stable, healthy countries bring benefits to the global community. Conversely, fragility and violence can have negative economic spillovers. Transnational crime and terrorism can take root in places where the state does not function and conflict rages. If development agencies are to make inroads into eradicating fragility and conflict and promoting development in FCASs, business as usual is not an option. Traditional approaches that have proven successful elsewhere often do not work, and sometimes do more harm than good. Assistance to FCASs often has little impact and is ineffective. Building roads or supporting special economic zones may lead to growth in many developing countries, but FCASs tend to have poor absorptive capacity, and when programs are not well designed and implemented—mainly due to lack of understanding of the local context—development objectives are not achieved. The binding constraints to growth and development in FCASs are usually political at least in part, and technically sound solutions that do not fit with political realities will often have little impact. In Afghanistan, aid amounted to $57 billion and accounted for 74% of Afghanistan’s GDP in 2002-2010. Weak institutions were not ready to receive such large amounts of external support, which lead to slow implementation of projects, low sustainability, and market distortions. Sometimes, aid can even be harmful. Assistance to FCASs that is designed and implemented in ways that do not take account of existing political dynamics and factors that drive violence can do harm. Aid can fuel corruption, further embedding dysfunctional governance. Aid that extends the control of the central government over restive areas with ethnic or religious minorities may lead to a violent backlash. Donor support for expanding state education to minority ethnic areas in Myanmar has led to resistance that has negatively affected the peace process. Choices of what to work on and where must be driven by a solid understanding of the drivers of fragility and conflict and the political, economic, and social context. Such strategic assessments should be done not only in states formally labeled as fragile, but also in countries where subnational conflict and fragility are an issue. Selection of projects to finance must be based at a minimum on an assessment of sectors and geographic areas where projects are not likely to do harm. Where possible, governments and all concerned stakeholders should be involved in this process, which should be based on identifying where projects can promote transformative change that reduces fragility and conflict. Project design must reflect the local political economy, social dynamics, and contestation in areas where a project will operate. Instead of just one-off conflict assessments, there is a need to develop monitoring systems with constant feedback loops to respond to changing conditions. This means hiring savvy, local staff, empowering them to report where projects may be ineffective or harmful, and building systems to respond to that information. It also means being careful about whom to select as local partners or contractors. Working in FCASs requires both long-term engagement and flexibility. Long time spans are needed to have impacts. Continuing presence is also necessary to build trust, a requisite for any work in FCASs. Projects and approaches must be flexible, so that they can take advantage of new opportunities as they arise and allow for course changes when projects prove ineffective or harmful. This may require creative procurement and risk identification and response strategies. We must find new ways to measure progress at the country, subnational region, and project levels. Fragility indices, including the one developed by ADB, serve an important function, tracking how countries are doing according to a range of indicators. But there are many elements of fragility that these numerical scores cannot capture. Assessing change over time requires new methods that focus on particular bottlenecks to change, and better local measures and evaluation strategies, so that we know what works and what doesn’t. This blog was commissioned by ADB as part of a joint ADB-TAF workshop on assessing fragility held in Bangkok on 15-16 June, 2015, and originally published in the In Asia blog.